The Neomartyrs are lumninaries, namely stars, who rose in the firmament of the Church during the terrible winter of slavery. They are the new athletes of Christ. They are the thrilling preachers of the Divinity of Christ. They are the champions of piety and the opponents of impiety. They are the partakers of the Lord's sufferings and His imitators and followers. 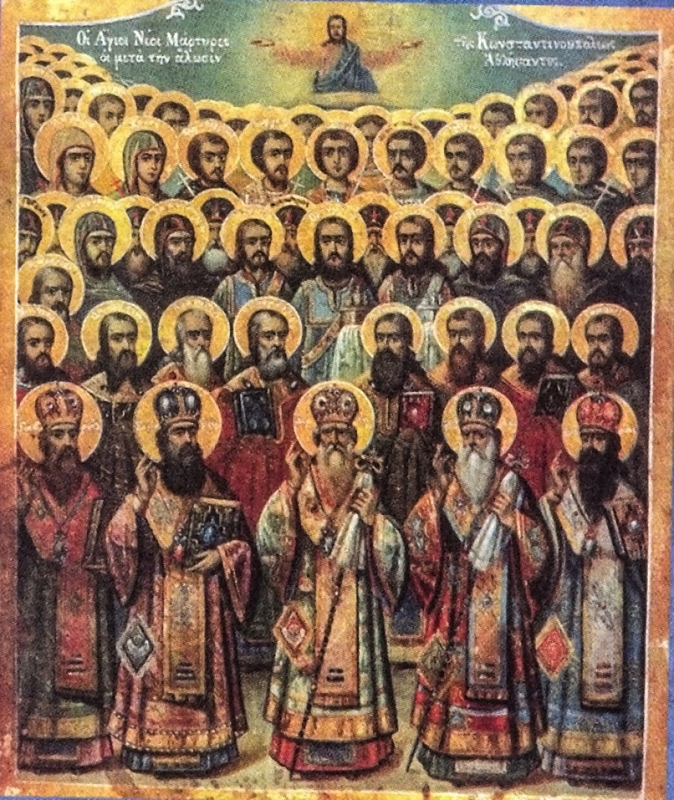 They are the triumphant victors against the three great enemies: the flesh, the world and its rulers, as Saint Nikodemos writes in his Encomium. And this confession, which was recorded by the Angels, sought to reject the occupiers and was an immediate confirmation of the Orthodox faith. This fight for the faith was made present by the multitude of the chorus of Holy Neomartyrs. First, they fought against the various passions which sought to dominate within their souls and lead them to destruction. How many things were they offered by the conquerors: riches, glory, honor and pleasure, in order to loot the treasure of their faith! And their response to all these challenges of the conquerors was amazing: "I was born a Christian, and a Christian I will die!" Second, they fought against sin in all its forms, which affects the purity by which God made us and drags us into wickedness and misery. Sin hurts the image of God, removes gentleness, and alienates people from the presence of grace. One does not "battle against flesh and blood, but against the principalities, against the powers, the rulers of the darkness of this world, against the spiritual hosts of wickedness in heavenly places. "6 This is why these persons, with a firm will and having on their lips the name of Christ, followed the advice of the Apostle Paul: "Remember Jesus Christ who rose from the dead,... according to my preaching. "7 Thus they subjugated every enemy and adversary and arrived at the glorious end in triumph both in this life, and especially in eternal life, thereby enjoying the ineffable joy and bliss of Paradise. Third, the fighting spirit which characterized the Holy Neomartyrs, resulted in the confession of their faith in the person of Christ that led to their martyric death. They had amazing stability in the Orthodox Christian teachings and traditions. They had admirable perseverance during inhumane and terrible torture, to which they became subject by their persecutors, and they remind us of the martyrdoms of the ancient Martyrs of our faith. They had forbearance, forgiveness and at the same time prayed for their torturers. 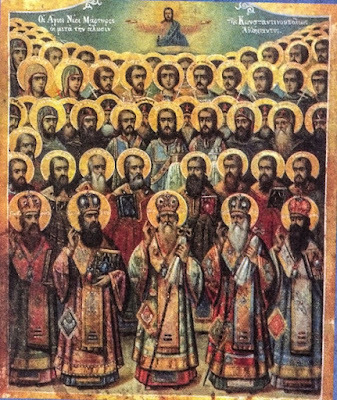 The Holy Neomartyrs, who were martyred during the four hundred years and like a heavenly cloud cover our long-suffering country, come to us today to remind us of the debt we owe them for the treasures of our faith. This faith is not a theoretical teaching, nor an intellectual theory. Faith is life! And this life is associated with true life, which is Christ. If there is true communion with God, then we will find ourselves in an actual state of liberation. Away from God one is fragmented, internally and externally, with conflicts, divisions and schisms. Today, when our values have been smuggled, and the traditional social fabric of our country has changed, and the Holy Mysteries (such as Baptism and Marriage) have lost their sanctity and in our own way we have altered them into simple joyful ceremonies; today, when our relationship with God and the Church is limited to a formal presence; the Holy Neomartyrs overemphasize that we should not accept a reconciliation with sin, as well as any other derogation and irresponsibility in our interpersonal relationships that move us away from the Truth and complicates our lives, and ultimately leads to spiritual death and the loss of eternal life. I pray that the intercessions of the Holy Neomartyrs will strengthen us in these difficult times, in order that we may engage them and fight the good fight of the faith. 1. Doxastikon of Small Vespers. 8. St. Nikodemos the Hagiorite, New Martyrology, Prologue.